Amazon Fire TV is the best way to experience Prime Instant Video. It is an impressive living room debut for Amazon. Amazon's device is a box you plug into your TV that runs on an open Android ecosystem and comes with plenty of apps including Netflix, Pandora, Hulu Plus, Crackle, and more. Unfortunately, it lacks HBO Go and Vudu, which is a damn shame. Amazon Fire TV is the best way to experience Prime Instant Video. Prime members enjoy unlimited, commercial-free streaming of tens of thousands of popular movies and TV shows including The Hunger Games, Marvel's The Avengers, Under the Dome, Downton Abbey, Justified, SpongeBob SquarePants, Dora the Explorer, Amazon exclusives like Alpha House, and many more at no additional cost. The interface is pretty simple. Its user-friendly interface makes it easy to find what you want. Browse popular movies, shows and recommendations personalized for you right on your home screen, and instantly add new discoveries to your Watchlist with a single click. Any content you’ve purchased from Amazon will be waiting for you in your Video Library. Amazon also offers flexible parental controls, and the kid-friendly Free Time platform is coming to the Fire TV soon. And setup is incredibly simple. It supports 1080p streaming, and includes Dolby digital surround sound out via HDMI out. It is insanely thin. It comes with a thin, sleek, small black remote that works via Bluetooth. The biggest surprise from the Fire TV is the price, especially from the usually value-conscious Amazon. $99 puts it in the same league as more polished boxes, like the Roku 3, and the cost only rises when you consider that you really need a $99-per-year Prime subscription and the $40 Fire Game Controller to fully take advantage of the Fire TV's best characteristics. 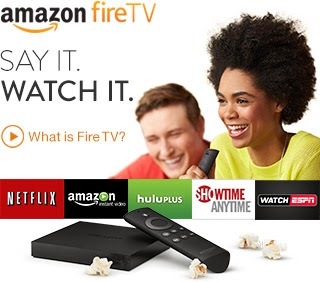 That's a lot to ask, especially when budget streamers like the $35 Chromecast and $50 Roku Streaming Stick offer much of the functionality people want for far less.